What a neat makerspace! The Stgo MakerSpace is located in a startup and innovation center in the Providencia neighborhood of Santiago, Chile. The center is a huge wear house and the makerspace is the second floor just next to a large open office. I am thankful that I got a tour and learned a little bit about the ideas of teaching and learning at the predominantly adult-serving makerspace. Innovation through proximity – The offices of the startup firms, including the first 3D printer production company in Chile (!!! ), are located in close proximity to each other. The hope and perhaps expectation is that this could foster unexpected ideas that could be turned into product prototypes at the makerspace. One example that was shared with me was the DIY furniture (e.g., tables and cupboards) of the makerspace. Two startups came up with the idea of using the project to explore working together. They planned, created, and then donated the furniture to the makerspace. Youth workshops by startups – Those firms that are located in the startup and innovation center and are using the makerspace to prototype projects from alternative musical instruments to sculptures of recycled materials are encouraged to pass on their learning. They are facilitating, for example, one-week long workshops for youth to explore a range of materials and concepts, from electronic tools kits to woodworking to programming. 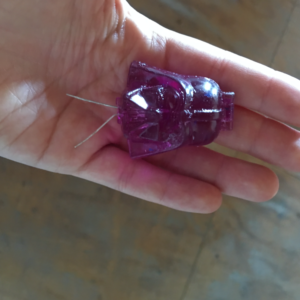 One example of such a workshop is the 3D printing of hollow figures of popular media characters that LED lights can be positioned inside of to craft a circuitry puppet-show.